Tapering is harder than you'd think. Not hard in the sense that it takes any effort. It's really the opposite of that. Even someone who embraces downtime (like me) can find it difficult to be completely inactive. After focusing on training for a month, our bodies are tuned for action. At least they should be. The morning was quiet on the business side, so my wife and I decided to head over to Bethpage State Park for a low impact walk on the bike trail. I figured that level of activity wouldn't significantly violate my taper, and it might just help shake out some built up lactic acid in my leg muscles. The weather was cool and sunny and we went south on the trail as far as the Beach St. exit. We're both brisk walkers, but we kept it at a comfortable pace today. On the trail back, we talked about the number of cyclist we'd seen who weren't wearing helmets. 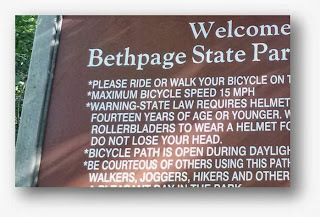 I noticed the sign above that encouraged the use of helmets with the plea, "Do not lose your head." Good advice. We'll be heading to the Laurel Ave school in Northport a little later today, so I can pick up my bib number and race bag. My family won't be joining me tomorrow, so I won't have any place to stow my race shirt in the morning. I could do the UPS baggage check but, with 5,700 other runners, the wait for pickup can take a while. It's hard to believe that it's just hours until the start of Cow Harbor. I hope I'm ready. Good luck tomorrow! All the training you did will make for a positive experience. Hopefully, it won't be too humid. Maybe I'll see you there. Hi Paul - glad to know you'll be running it this year. Best of luck as well. I'm hoping for the best and for some decent weather. I'll look for you among the crowd. Best wishes for a fantastic race tomorrow. You've worked hard to be ready, and I've enjoyed reading about it. If I don't see you before the race, have a great one today, ER!